Russian and international aircraft manufacturers gathered on the outskirts of Moscow in mid-August for the 10th annual MAKS international air show. Global buyers and flying fanatics alike have taxied up the runway for the best that aviation has to offer at the MAKS International air show, taking place outside of Moscow. More than 100 planes are taking part in a skyline showcase. Billions of dollars' worth of aircraft sales are set to be inked as the international air show reaches the end of its second day. The biggest and the fastest on display range from the world’s largest cargo plane, the AN-225 Mria; and its biggest passenger plane, the Airbus A-380; to strategic fighter jets. Russia's state-run United Aircraft Corporation expects to sell its brand-new MC-21 passenger jets during the event. Touted as an airliner of the 21st century, the MC-21 is carrying Russia’s hopes of breaking through the Boeing and Airbus duopoly. There is a lot riding on the fate of the MC-21, an airliner said to be kind to the planet and cheaper to run. It represents the efforts of a Russian aircraft industry that has so far failed to break into international markets, and it will have to be as modern as if it is to survive the competition. As a short- to mid-range passenger jet, it will be going up against the likes of the Boeing 737 and Airbus A320, both well-established planes. Its makers are fully aware of the challenge ahead. “We understand that we are not first on this market and the market niche is very hard, but we hope we will have our own niche in this market and we will succeed,” said Irkut Corporation’s Dmitry Efanov. They are confident the MC-21 will be a technical match for its competitors. With a third of its components made of light composite materials and a totally new airframe, it will save on fuel. “Our plane has advantages over the present Airbus and Boeing models. It has about a 15 percent lower operating cost,” said Alexei Fyodorov, president of the Irkut Corporation. “We used the engineering capacity of Sukhoi company, Sukhoi civil aircraft, Tupolev company and Ilyushin,” said Fyodorov. One of the most-anticipated events of the show was the first public performance of Sukhoi’s T-50 (PAK FA) 5th generation stealth fighter jet with unprecedented missile capacity. 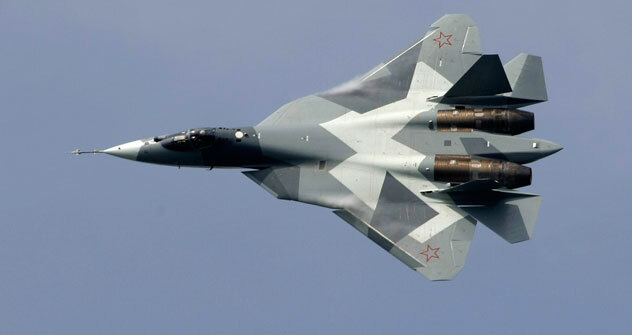 The T-50 was developed under the PAK FA program (Future Aviation System for Tactical Air Force) at the Sukhoi factory. The service has relied on the Mikoyan MiG-29 and Sukhoi Su-27 family of combat aircraft as the core of its fighter force since the mid-1980s, but these aircraft are seen as approaching obsolescence. The Russian firm that produced the Soyuz space rocket has also shown off a new twin-engine multi-role turboprop at MAKS that could replace hundreds of obsolete flying workhorses around the country. Samara-based TsKB Progress, says its Rysachok, which translates as "Colt," is currently undergoing certification flight trials, after which it will go into mass production. The company expects Rysachok to be used for parachute-drops, pilot training and medical evacuations. The 10th MAKS air show is a truly international event with all the world’s major plane manufacturers present. The show runs through Aug. 21.